Types of Duty . The Role of Women . Women's participated actively in the PHS. 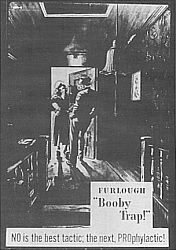 The United States was very progressive in women's rights, and used every human resource in World War II to further victory, regardless of social objections. Therefore, qualified women were placed in the front-line of all PHS work based on their ability. Naturally, this would be true for nurses but was also true for female scientists and medical doctors. This led to many opportunities for women not available elsewhere. .. Since 1912, professionally trained graduate female nurses worked in public health hospitals more widely. 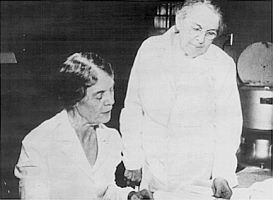 Their work included general district nursing, tuberculosis nursing, school nursing, infant welfare, visiting in mill villages, emergency communicable disease control, and venereal disease clinic work. Left Picture: Black PHS nurse with her medical bag (1920s). 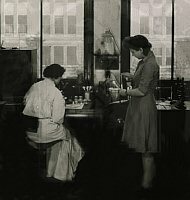 The first women employed on the scientific staff of the Hygienic Laboratory were bacteriologists Ida A. Bengston, on the left, and Alice C. Evans. For example, a woman with a Ph.D. in Physics or Chemistry could find uniformed service duty in the PHS much more important and glamorous, than if she joined a military branch (where she would just be another lieutenant serving beside with those having basic or little college background). 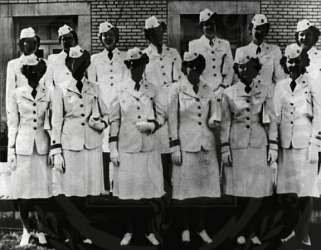 These nurse officers are wearing the white uniforms of the commissioned corps of the Public Health Service during World War II. .v Another example would be a woman aviator who was also a doctor. She might join the WASP and fly planes, or join the Navy and be a medical officer. In the PHS, she could become a both an aviator and flight surgeon. Finally, a nurse could be selected for top national assignment with the Office of Strategic Services (OSS) from the PHS. during 6 October 1945 - 2 November 1945. Her mission might have been to determine radioactive contamination levels resulting from the Hiroshima atomic weapon (a gun-assembly type that employed U-235 as the fissionable material) and the Nagasaki atomic weapon (a Pu-239 implosion device). Other PHS nurses might have parachuted into occupied countries (Norway, France, Greece, etc.) as part of larger OSS teams dispatched to aid resistance fighters with weapons, medicines and leadership.
. The Public Health Service was part of the Federal Security Agency during World War II, which meant that it operated at a level beyond the War Department and the Army or Navy. 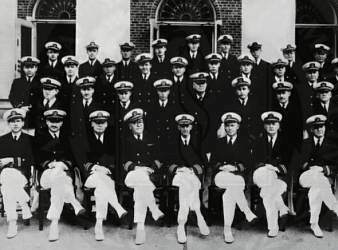 Many medical officers were assigned to duty either with the armed services or the War Shipping Administration. Additional medical officers were assigned to the Coast Guard. The Service became fully engaged in combat operations, to include medical support of Office of Strategic Services and its clandestine special operations. The military status of the Public Health Service was confirmed in 1943, reinforced in 1944 and it became a full part of the military forces in 1945. The hospital facilities of the Public Health Service were made available for the care of patients whose treatment was requested or authorized by the Army or the Navy. The San Francisco Public Health Service Hospital with ambulances parked in front of it (c.1920). Posters like this one from 1940 were a popular part of the health education program. .v The Service was also active in other war services. It acted as the approving agency for construction of public health, sanitation, and hospital facilities under the Lanham Act. Service personnel cooperated with military authorities and other Federal agencies in the development of their medical and public health programs. Venereal disease control activities were intensified and rapid treatment centers for infected persons were established. Provisions of the Venereal Disease Act of July 9, 1918, and the amendment to the act approved May 24, 1939, were embodied in the Public Health Service Act of 1944. Special programs were set up to control plague, typhus fever, malaria, and tuberculosis. The Tuberculosis Control Section was as redesignated Division of Tuberculosis Control, by the Public Health Service Act of 1944 (58 Stat. 682) on July 1, 1944. 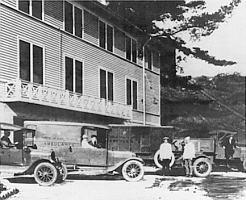 The Office of Malaria Control in War Areas dispatched medical personnel to forward areas of fighting in the Pacific and the China-Burma-India Theater. .. 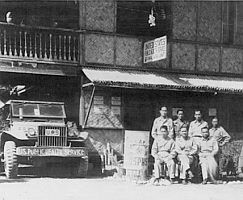 The Malaria Control Unit of the Philippines Public Health Rehabilitation Program in front of their headquarters, c. 1946. The nation's highest medical needs were attended to, above the level of the War Department (i.e., above Army and Navy levels) by using PHS resources. .v The OSS acquired female medical personnel for top-echelon and secretive missions, by gaining necessary personnel from the PHS. Potential recruits were selected from the Cadet Nurse Corps (CNC) and graduated into the PHS to undertake high-risk and high-value assignments. The CNC was the primary PHS recruitment base, although many completed an accelerated training program. Probably the best and most willing were identified and then expedited in preparation for selected missions. 1. . The US Public Health Service was part of the Federal Security Agency of the United States Government during World War II. 2. The Commissioned Corps of the Public Health Service had been uniformed and in service for decades, but was not part of the armed forces. Yet most people in the country did not even know that a national Surgeon General and Assistant Surgeons General existed, or that a force of commissioned officers of this type existed. 3. The Public Health Service was small compared to the Army and Navy, and did not seek volunteers with major recruitment campaigns. During the war, the PHS could recruit directly from its own CNC and other resources in a more quiet and effective manner. 4. Because PHS officers were already a uniformed force, existing at the highest national level, it could be used to fill special duties (especially above Army and Navy) with expert professionals of the highest quality and levels of trust. It could easily draw on both men and women who were commissioned officers with high prewar standards and impeccable credentials (graduate degrees, medical capability, etc.). 5. Finally, the PHS was mostly involved in national public health matters that were not strictly military in nature (thus justifying its existence before and after every war).
. The Public Health Service cooperated with health agencies at every level pertaining to public health, health education, and sanitation. The Public Health Service Act of 1944 directed the PHS to help states, counties, health districts, and other political subdivisions establish and maintain adequate public health services, including the training of health workers. This legislation also enabled the Public Health Service to develop measures to prevent, treat, and control tuberculosis and to assist states involved in the tuberculosis control program. The Public Health Service helped in many emergency health activities. For example, the Service assisted state and local health authorities to maintain proper sanitation facilities and provide other health protective measures in military, naval, and industrial areas where large concentrations of troops or abnormal increases in population existed as the result of war industrial activities. Services to the States in the development of industrial hygiene programs were expanded. 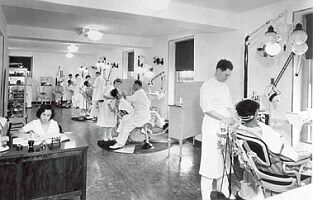 .v Dental clinic at the New Orleans Public Health Service Hospital, c. 1935.
. The National Institute of Health and field stations investigated the causes and methods of prevention of diseases under the Public Health Service Act. This act, which embodied provisions of the National Cancer Institute Act of August 5, 1937, also authorized the National Cancer Institute. Parasitology Diagnostic Laboratory, 1944. .. Diseases of special importance to the military forces were studied. Yellow fever and typhus vaccine were supplied to the Army and Navy. Rocky Mountain spotted fever vaccines were distributed for both Army and civilian use. Nutritional research related to military needs was accelerated. Laboratory investigations expanded in toxicological areas. New industrial substances and processes were studied. 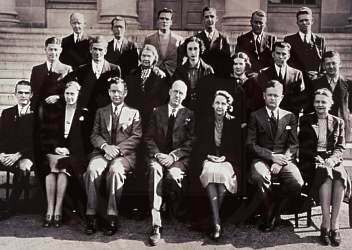 Advanced research was conducted in aviation medicine.
. A biological weapons program was initiated in 1943 that assembled and stored thousands of anthrax bombs, but the American biological warfare programs never matched those of France, Canada, Great Britain and Japan. On the home-front, the Public Health Service supervised the manufacture and sale of biologic and analogous products used in the prevention and treatment of disease through inspection of plants, tests of products, and license. This insured, to the highest degree possible, the purity and potency of standard products. Standards for the collection, drying, and storage of human blood plasma for wounded soldiers were established by the PHS. The Public Health Service conducted maritime quarantine activities, in order to prevent the introduction of disease from abroad. 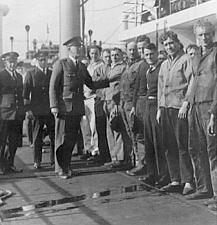 The PHS made physical examinations of immigrants, and inspected passengers and crews of vessels and airplanes arriving from foreign ports. The Service tried prevent spread of communicable diseases between the states. Quarantine surveillance was intensified throughout the war, especially at airports, maritime ports, continental borders, and in the Caribbean area. .v Medical officers of the Public Health Service's Division of Foreign Quarantine inspecting crews of cargo vessels from foreign ports (c. 1930). PHS outdoor dress uniform, 1939-1940 v The Public Health Service furnished hospital treatment in 150 ports of the United States and its possessions, provided by 25 marine hospitals, 120 other relief stations, and 133 contract hospitals (located in ports not served by the marine hospitals). The Service operated a hospital for treatment of those with leprosy (the National Leprosarium in Carville, Louisiana); staffed two hospitals for the treatment and rehabilitation of drug addicts; and administered Freedmen's Hospital in the District of Columbia. It also studied and issued information on mental diseases, and supervised the medical and psychiatric services within federal penal and correctional institutions under the Department of Justice, as provided by the act of May 13, 1930. .
. The Public Health Service collected, compiled, and published reports of communicable diseases in the United States and foreign countries, as well as other information relating to public health. It disseminated general health information through publications, exhibits, moving picture films stereopticon slides, posters, and other educational means. WWII advertisement informing soldiers and other citizens about the new wonder medication penicillin which was first introduced in 1943 in limited amounts and then in massive quantities by 1944. 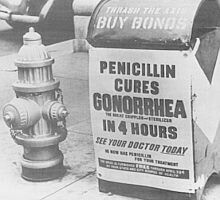 Penicillin had revolutionary effects in controlling infections and venereal disease. .. The regulatory functions of the Public Health Service concerned administration of laws and the regulations relating to maritime and interstate quarantine. and to the control of manufacture and sale of biological and analogous products. 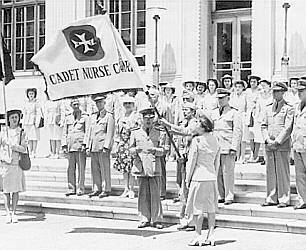 Presentation of the Cadet Nurse Corps in Washington, D.C., in June 1944. .v Under the provisions of the Bolton Act, the Public Health Service administered a program of nurse education. 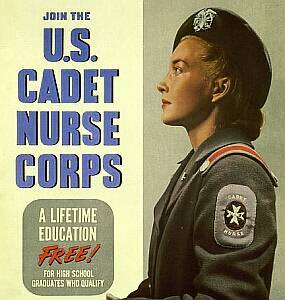 The war nurse training program called for recruitment and training of 125,000 new nurses during 1944 and 1945. Trainees enrolled in the U.S. Cadet Nurse Corps received free training, maintenance, uniforms, and a monthly stipend.